This product requires the base game WRC 5. • 13 races for the following rallies: Rallye Monte Carlo, Rally Sweden, Rally Guanajuato México, Xion Rally Argentina, Vodafone Rally de Portugal, Rally Italia Sardegna, LOTOS 72nd Rally Poland, Neste Oil Rally Finland, ADAC Rallye Deutschland, Coates Hire Rally Australia, Tour de Corse Rallye de France, Rally RACC Catalunya-Costa Daurada and the Wales Rally GB. • 3 cars created only for the official FIA World Rally Championship video game: the WRC Concept Car E1, the WRC Concept car E2 and, as an exclusive with the Season Pass, the WRC Concept Car eSports Edition. 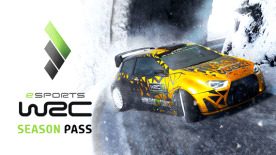 Important: this pack includes additional WRC 5 content that will become available between January and June 2016, divided into two downloadable content packs. WRC 5 is required to play this DLC.